This is the post I’d written for yesterday before the shark-killing post. Famous virologist Jonas Salk (developer of the Polio vaccine) once said that our greatest responsibility was to be a good ancestor. And you’ve probably heard the American First Nation’s belief that the Earth actually belongs to the seventh generation following us. These are also key environmental beliefs, that we are responsible for protecting the world as well as our children and our own self interest. I won’t divert into core environmental credoes here but I’d like to show three striking charts and then ask you a question. First is the reduction in 100 hundred years of the amount (weight/biomass) of higher layer (pelagic) fish in the North Atlantic. See how vacant the second chart is compared the first. The Newfoundland and Grand Banks cod stocks are now to all practical purposes gone. It’s expected that they will never recover. Atlantic tuna has been fished past the sustainable point and as I pointed out a while ago, no agreement has been made even on quotas. The second is the reduction in fish landed (caught) per unit of power used by the UK fishing fleet. This is useful because it captures (and can ignore) technological advances like sonar and offshore global fleets, and shows the catch has still plummeted for the amount of work employed. But fishing as a whole hasn’t stopped. World consumption has increased. For the swimmers who worry about “things” in the sea with them, would it really be better if the sea was completely empty? Because it’s going that way. 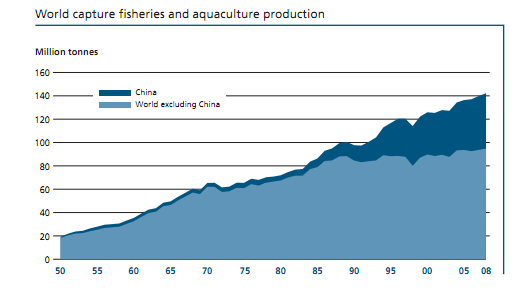 State of the world’s fisheries report here.